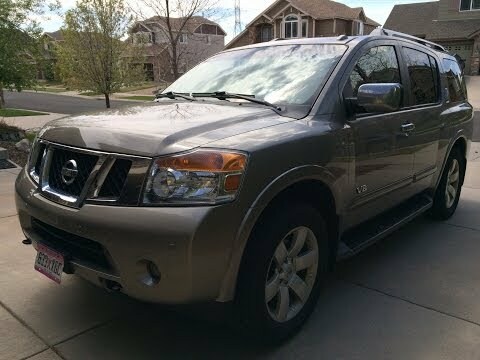 I absolutely love my Nissan armada. Having 5 kids, I really enjoy having the DVD player/headphones, the middle console in the middle row, multiple cup holders, and the 3 rows of space. One of my favorite features is that the very back row of seats fold down and up electronically. It really helps out when my hands are full of groceries or children. My car has two captain chairs in the middle row but I have recently heard that there are other armadas with bench seats for the middle row. I like having the captain chairs for my two youngest car seats, but I think a bench seat would be awesome also. The sunroof is a nice feature. And I love the screen on the dash for watching movies up front also while the brake is on, it is nice to pass the time when I am waiting in the car for whatever reason. The navigation system and the music box are also really great to have. I love this vehicle so much that when it eventually dies only I plan on getting another one exactly like it! Right stuff in places for buyers desiring a full measure of large SUV experience. The Nissan armada does well in the performance department. Its v8 engine produces more horsepower than some rival engines, and it can move the armada without feeling strained during acceleration, on the highway, or while towing. Despite its large size, the armada has a respectable agility that leaves it capable of taking turns and executing maneuvers without much body roll. The ride quality is also pretty good. Why I love my Nissan armada. It is a big SUV it seats 8 people good for big families. Good for long trips. Mine has a DVD inside for the kids. Very roomy. Good on gas if on a highway but if just driving short distances like street lite to street lite it will eat up your gas in no time. Good if you are your friends are taking a road trip I have done that before. Overall I like big trucks so I love my armada.